I've wore the Meindl Vakuum GTX Walking Boots for Women for a number of 10-12 mile day hikes around the White Peak and Cheshire in the UK Spring with a relatively light day-pack. I was delighted to find that breaking - in was totally unnecessary and they were really very comfortable straight out of the box. I was particularly impressed with the foam system around the ankle and collar. When combined with the shock absorbing features of the sole, it's clear that this a boot designed to really look after your feet. Mine felt as good at the end of the day as they did at the beginning even after a walk that included some long road/asphalt sections. I normally wear a size 7 shoe but was testing a size 7.5 boot plus my own orthotics. 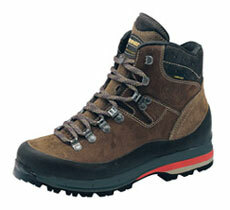 This is a relatively high volume boot (which suited me) but may not suit someone with narrower feet. For me, though, the two zone lacing system meant that I was easily able to adjust the fit at the front and around my ankles to suit me well. As with the men's version - the Meindl Vakuum GTX Walking Boots for Women are a fine pair of boots from a manufacturer with a long tradition of quality boot making. The range of features in what is a relatively light boot is very impressive.